I watched the Oscars last night. I watch them every year, or try to at least. This year, as the show began, I realized I had no personal stake in any particular nominee. I had barely seen any of the films, so I wasn't rooting for anyone. I hadn't filled out a betting pool or made picks, so the winners didn't need to be the "right" ones. So why was I watching? What draws me to this self-promoting Hollywood masturbation fest? 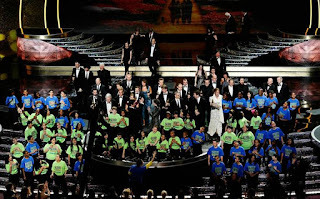 1: For some reason I find the Oscars creatively inspiring. I don't know if it's a brief rekindling of a child-like dream to walk the red carpet and win an Academy Award, or if it's just watching three hours dedicated to honoring people's creativity, but the Oscars somehow leave me energized. Which is why I really enjoyed James Franco and Anne Hathaway. Yes, James Franco was wooden and dead-pan, but that gave Anne Hathaway something to react against. She wouldn't have come off nearly as charming as she did without him. I thought they did a great job, and reviewers waxing nostalgic for the glory days of Billy Crystal and Bob Hope are kind of missing the point on what a "host" does. A good show host keeps the show moving, smooths out the transitions, provides important information, is occasionally entertaining, and connects with the audience in the theater and at home. Anne Hathaway did just that with James Franco serving as her foil. I cannot comment on the Bob Hope days having never seen them, but during the Billy Crystal years, the show was a big stand-up routine interrupted every now and then by an award presentation. Yes, they were entertaining, but they were also disjointed and always ran long. Last night stayed on-time and seemed to strike a good balance between fluff and awards. We even got to hear the Oscar nominated songs for the first time in years. Sure most of the writing for the presenters was unbearable, but have you ever seen the Oscars before? That was nothing compared to years past. Hathaway recovered from a flub with grace, and wondering what dress she'd be wearing next kept things interesting if nothing else (my favorite was the flapper dress). Sure her song about Hugh Jackman was pointless, but at least she had the singing voice to pull it off and it set up James Franco in drag. They kind of wasted the PS22 Chorus by having them sing Somewhere Over the Rainbow , but I loved seeing all the winners on stage at the end. Anne Hathaway high-fiving the kids afterwards epitomized how great she was as a host: she was having a good time and just went with it. In short, I found them to be one of the more enjoyable Oscars in years. You just have to remember that the bar is pretty low. Alan, you are the kindest person on the planet.